Philadelphia Union made headlines recently, splashing some cash on transferring Brazilian striker Sergio Santos to Chester from his club in Chile. The move was a new one for the Union, as past front offices have been reluctant to pay transfer fees of any kind, let alone the alleged $500,00 that Union sporting director Ernst Tanner spent to acquire Santos. Tanner made moves for another attacker on Monday, re-signing polish forward Kacper Przybylko. Przybylko doesn’t stick out quite as much as Santos. He made close to the league minimum salary during his short season with the Union last year, and he’ll likely collect a similar amount next season. Przybylko also failed to see the pitch for any side last season, whereas Santos arguably had his breakout season in Chile. Still, Transfermarkt values both players at a similar, six-figure level, and Union fans have been starved of a top tier striker for a long time. They will be eager to see what Przybylko can contribute. Add these two international signings to a squad that already includes C.J. Sapong, Cory Burke, Fafa Picault (Tanner has implied that Picault will serve more of a striker role), and, for Bethlehem Steel, Faris, and you might actually feel optimistic about the Union’s prospects up top. Upon further examination however, such optimism is unwarranted. Unless, of course, you already felt that way before the Santos signing. Despite the flashy transfer fee, Tanner’s recent moves merely continue the same trends we’ve seen for years, the same trends that haven’t been good enough in the past. Sign a designated player-level striker. That’s what fans and analysts alike have been calling for the Union to do. A top goal scorer is key to winning a trophy in this league, and the Union will fail to win any trophies as long as they fail to make such a signing. A look at the Union’s roster makes it clear that they still have yet to make that signing. C.J. Sapong was one of the top goal scorers in MLS two seasons ago, but last season’s lackluster performance shows that, as defenses improve and the competition in goal-scorers increases, Sapong is most likely looking at his highest goal tally in the rear view mirror. 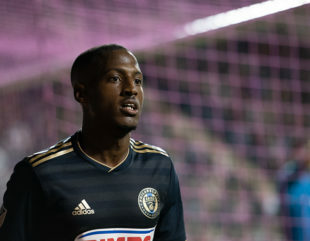 Cory Burke gave the Union an unexpected boon of goals last season, but he still hasn’t quite reached that elite status. Similarly, Picault was solid for the Union last season, but no other team would break the bank to grab him if the opportunity presented itself. As for Santos and Przybylko, their prospects are intriguing, as mentioned above. Still, Przybylko was an unsigned free agent when the Union picked him up for a low salary, and he made no impact on the squad. At best, he will be a good goal scorer for a great price. At worst, he’s a less expensive Jay Simpson, doomed to take up an international slot on the Union’s bench. Santos provides the best chance the Union currently have for that elite striker. He’s an unknown quantity who is potentially on the rise, but he was also only the 10th highest goal scorer last season in a Chilean league that is worse than MLS. And that was his breakout season. The Union need to sign that DP-level striker. They need it to win, and they need it to demonstrate to a fan base that is consistently waning in its interest that this club is still invested in their entertainment. None of these strikers fit that current bill, and with their new surplus at the position, it is unlikely that they will sign a striker that does. Neither does it help that this corps of attackers is getting older. By no means could one consider these players old. They are, however, old enough that they are known quantities. That is, they are not prospects. The prime age range for a player to really have a breakout is from 18-21. That is when a player’s most drastic development occurs. At age 29, Sapong is most likely as skilled as he will ever be. At 26, Burke will likely improve, but Tanner and head coach Jim Curtin will unlikely be able to mold him into a center piece of the team’s attack. At 25, Przybylko will surely improve, but looking at his unemployment in a global market does raise some questions about why teams don’t consider him a prospect for improvement. Fafa Picault, like Sapong, is nearing the age at which soccer players usually play their best but cease to improve by any drastic measure. His move inside from the wing may switch things up in Ernst Tanner’s new system, and the Union could unlock a whole new aspect of Picault’s game. Still, it is unlikely that even in a more fitting system, Picault will continue to develop as a young player. Again, if there is any exception, it is Santos. The Brazilian is 24, just past the typical age range for making that leap to the next level. If last season was indeed Santos’ breakout year, then we may continue to see him improve. Truly, it remains to be seen. The point remains however, that in all likelihood, the Union have a good corps of strikers that will not jump to the level of greatness. It is worth mentioning that this group of attackers looks good. They just do not have that elite attacker that a team can rely on in every game. Perhaps that will change. Perhaps Santos or Przybylko will be a Bradley Wright-Phillips, finding their perfect fit in MLS. Perhaps Fafa Picault will thrive in a more transitional offense and become that elite scorer that the Union have craved for so long. With a large group of above average strikers, would anyone really be surprised if none of them did big things next season? Author: Ryan Rose Ryan Rose is a freelance filmmaker and writer in the Greater Philadelphia Area and one of the daily editors for PSP. A graduate of Hofstra University, Ryan returned home to Philly in 2014 - mainly for the sports if he's being honest with himself. Mid table is the business plan and every article, conversation or discussion that ever gets written or spoken first has to surrender to this context. On the bright side— (and there is a bright side) Ernst Tanner’s eye for PROPER talent evaluation, for building and promoting youth players and selling those players, for his German worldview which is clear upon speaking with him for a about 15 minutes which I have been fortunate enough to do and willingness -already- to jettison underperforming and/or ‘no talent’ players, for his ability to stand over the academy setting and realize the eye for detail is not good enough, is our best hope. 2. The minutest of detailed……… PHILOSOPHY and exact idea on how to implement it at every single station of the academy form the 6 year olds to the USL team. 3. The building of proper players, promoting, then selling them abroad… PLAN. It all remains to be seen….there is so so much work to do. Even if we did sign a top level DP striker he will struggle for goals without at least half way decent service. Our leading assist maker is gone and we haven’t had a real no. 10 since ??? I’d give Tanner a bit of a break here, though the larger point that the goal is mid-table is spot on. Now with 14(!) teams making the playoffs, Philly can shoot for 7th. This team isn’t going to get anything like a Josef Martinez or a Wayne Rooney. I think he’s a better spotter of talent than we’ve had, so I’m going to extend him a chance, though my expectations are not terribly high. I like that $500k counts as “splashing the cash” for this moribund club. It’s actually depressing that this guy was the jersey name on their twitter tag promo. He walks and quacks like a Steel player. What’s his real ceiling? Fafa? Burke? I lost faith with this club and swing by this site like a junkie looking for a fix. Sergio ain’t enough. or Camel non filter and The Champagne of Beer? With all those 9’s has anyone thought of Sapong as a 10? He seems to have the right skill set and if things go well, he’s not going to see the field as a forward and possibly not as a wing. No. He very definitely does NOT have the proper skill set. Like LeToux, the skill level on this team is passing him by quickly. This literally never crossed my mind. I’m curious to understand what you see in his skill set that fits the demands of a 10? Totally disagree. #10 is the puppet-master pulling all the strings. Only thing Sapong has going for him beneath the forward is hold up play, but that makes him a second striker, not a #10. WHAT?! Sapong? C.J. Sapong? Can’t trap, Can’t turn, can’t shoot, can’t dribble, can’t run much Sapong? How is he a 10? Nah, Sapong can’t read the game well enough to even make the right runs with a real #10 so how would he know how to do it when he has to make the pass. $500k would have been splashy when in this league? Years and years ago. Neat that Tanner already seems better than Stewart but still a knife to a musket fight, or some such. The guy scored his goals in only 16 matches. I’ll take that hit rate and the assumption that he’s on the up-swing, trying to earn a European pay day. People I think are being too negative about this move. Dude looks like a legit player and it’s only TAM money. We haven’t replaced Dockal with this dude in terms of salary allocation. There’s at least 1 more bigger signing to drop still. I also think people are assuming we are going to be running a base 3-5-2 and I’m not sure why. Yes Tanner said he wants to be able to show different looks, but I never got the impression we were moving off the base 4-2-3-1, just that he wants to play it a little differently. ownership is the pits……cant move up the table without new owner who has enough money to make meaningful signings that last for more than two years. imagine if this team had Doakal, Barnetta and a legit striker. We would actually be able to win a play off game. maybe even advance. team will hover around the middle or worse until sugarman sells team. its an investment for him. not a passion. Tim made argument that KR was traded as he hit 25 years old mark. But list above…only Kasper is under 25 barely so for once Tim’s excellent analysis failed. Likely more to do with contract as JT said. Personally glad KR left since Curtin is staying. Hope he does great in Colorado and usmnt showing.